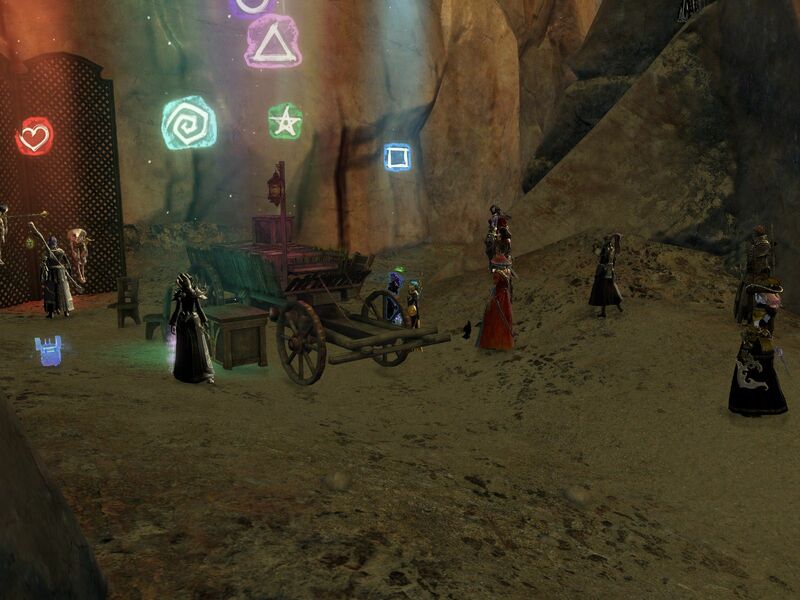 The Court of Thorns is an established (NA) Heavy Roleplaying Guild founded in October 2012. The majority of our memberbase is on the Tarnished Coast server, and our focus is a plot based, ongoing storyline atmosphere with plenty of room for character development. We've taken inspiration from the Court Hierarchy established in Guilds Wars 2 Lore and have an engaging member base from different parts of the globe. We strive to be as mature and as thick skinned as we can and our memberbase is highly proactive. The member base is also very interested in keeping up with current in-game lore, so we tend to mix up our activities with the occasional PvE day. Be it running a dungeon or completing some guild missions. Though as always, our focus remains on RP above all else. Interested? You can apply here, check out our expectations here, or continue reading below. Our recruitment is currently CLOSED. We want you in here! Yes you! We want all your Dreamers and Soundless locked up in the Cage Quarters right now to become Courtiers! Do you love tragedy and terrible things? Does your character have an inner lust for cold bloodied murder but just needs the confidence punched into them? Well we're here to fill that need! The Leaders, Officers, Recruiters and Members are all persons at the age of maturity with career success behind (or in front) of them. In turn we're all pretty thick skinned from these hardships in life. We banter daily with one another and even do social activities (such as CAH, Town of Salem, etc) via Discord so we can get to know one another a bit better. Are you looking to interact with characters too cruel and edgy for their own good? Well we got that covered as well! Our malevolent Courtiers strive to be the definition of this to the extreme. It's our hope we can enter a book of records one day. We have no shame in confessing our character are edgelords. (I once cut myself on my own roleplay). 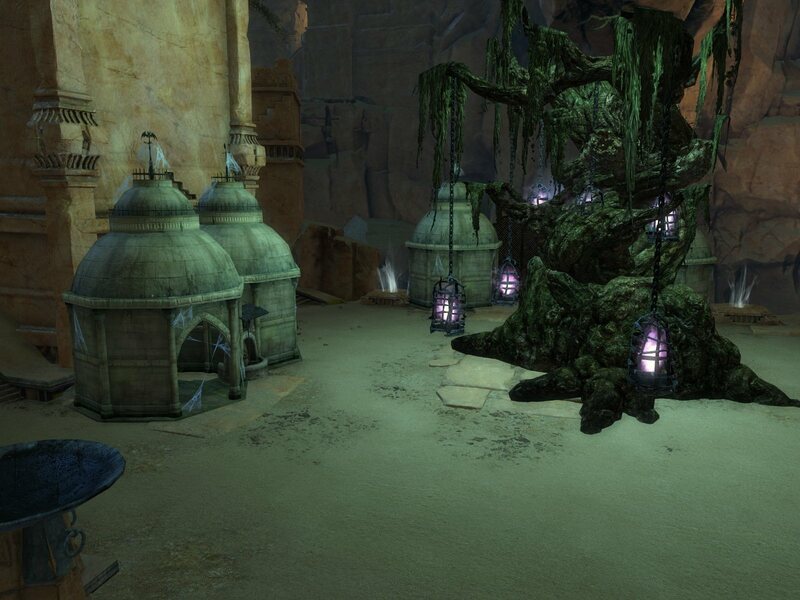 Here are some more screenshots of the environment you'll be thrown into! Click here. 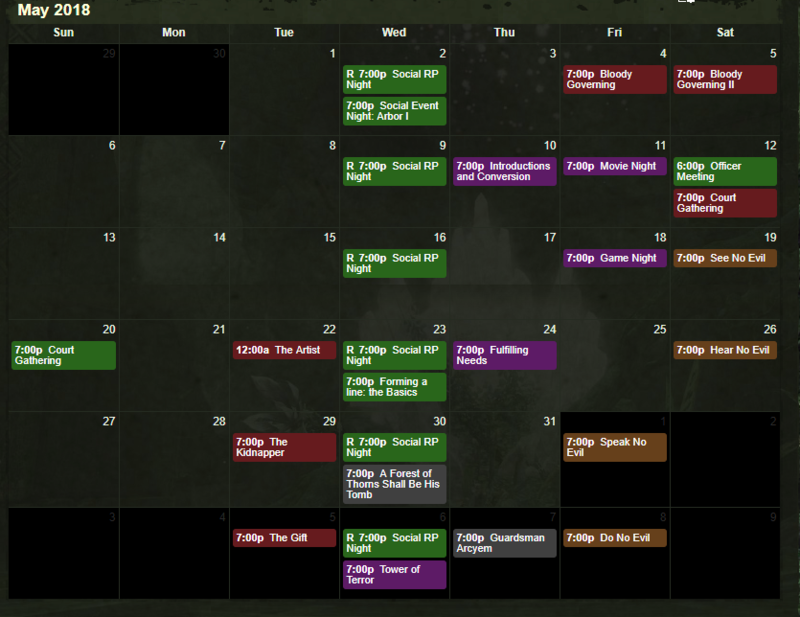 Weekly events, be it plot, side plot, member run or social related. 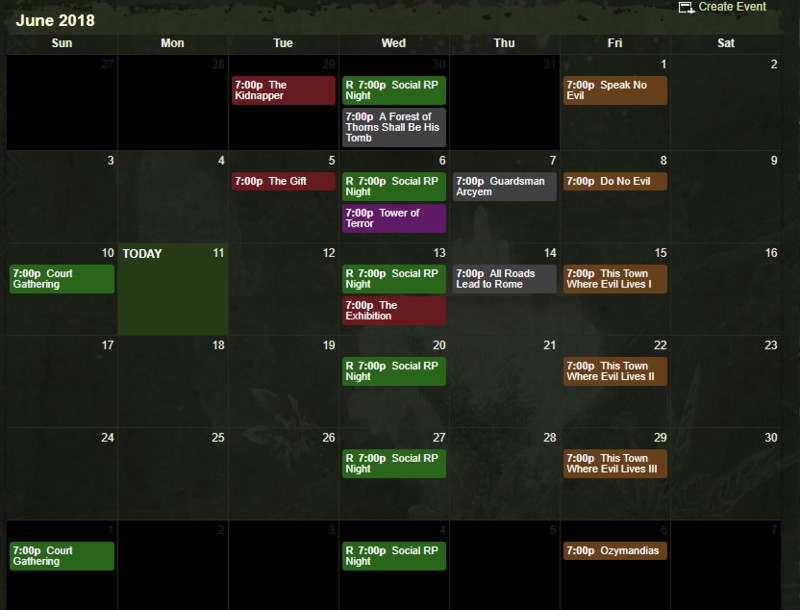 Here is a screenshot of our Calender in May 2018 & June 2018 to give you an idea of our average line up per month. Need more to do between events? You'll find someone around looking for RP! We have a dedicated Recruitment Team who are here to ensure you get involved with as many members as possible, alongside an active Leader Team who are pumping out things to do. Our Leaders, Recruiters and Members also put out non DM pick up Missions for all characters! Example of some are here. 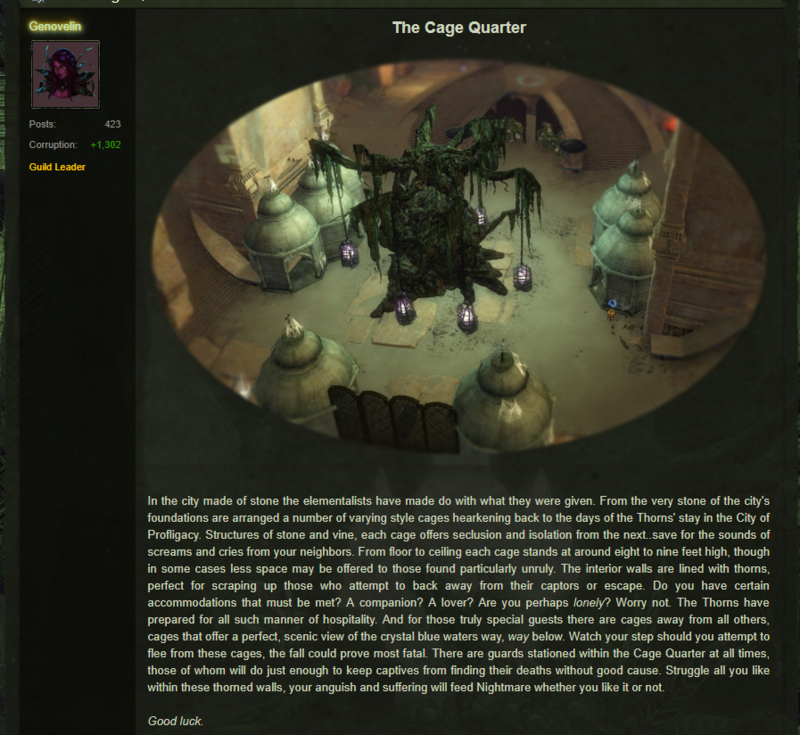 Our Forums are also extremely active! 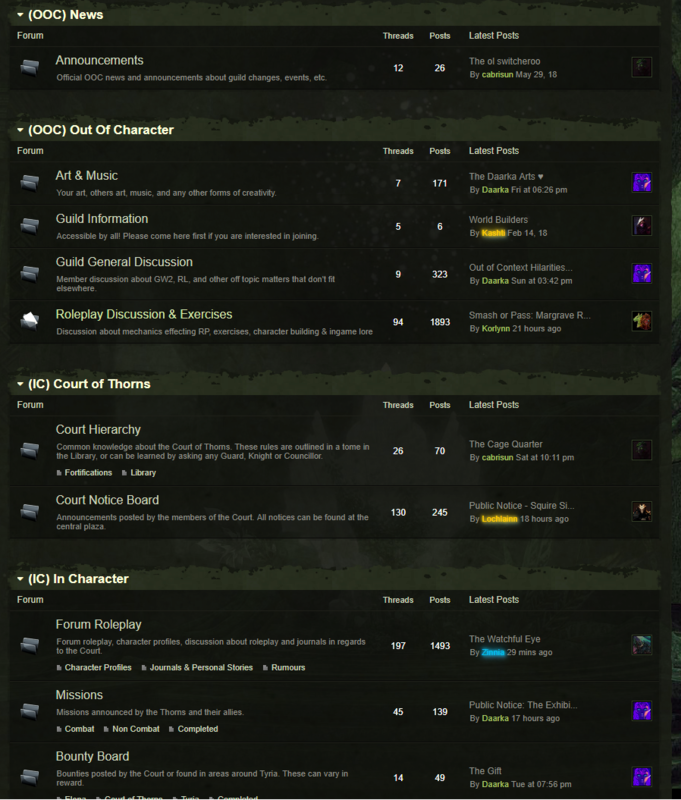 Quick screenshot of our forums as of June 2018! Character progression through these storylines, as well as a natural means of progression. Starting as a Dreamer / Soundless you can become a Courtier then move to Aspirant, to Squire, to Knight and possibly beyond! Our promise to be terrible people, but mature and thick skinned. We'll communicate with you, help you if you do have trouble getting involved. We'll always upkeep quality over quantity. We don't want this to just be RP, we want this to be a great novel that you'd love to read time and time again. Standards to the max! A drama free environment. No seriously, we mean it! Our Leaders and Officers are quick to stomp out troublemakers. We aren't shy about giving someone the boot if they're trying to stir drama. But as we do uphold high standards our current memberbase does communicate with one another! Same to you, potential new member! We'll always make the effort to communicate and raise any concerns. Every problem can be resolved via discussion so long as both parties want it to happen. Q: You mentioned thick skinned? What do you mean? A: These are our average discussions in guild chatter and Discord when we're fooling around! Click here but prolly a little NSFW. We definately don't angle for the 'family OOC' approach for this reason! We're all friends who heavily banter and we love to make horrible dark jokes. If you're easily offended this isn't the place for you. Q: What is this hierarchy you speak of? A: It mimics a human monarch to a degree! There is a Duke or Duchess, beneath them are their council who are the Retinue (Counts, Barons etc). Then beneath them are the main body of the Court, the Knights, Squires, Courtiers and Aspirants! Q: Can I join if I am under 18? A: You must be 18 years of age due to the high degree of violence in the guild RP. Even if you are a day away from the magic number of adulthood, you will be declined. Q: What are your activity requirements? A: Super lax! Just show up once a month to an event or RP. We'll allow extended MIA so long as you give us notice. Q: How long do applications take? A: We typically get back in touch within 24 hours. We may take a maximum of 7 days! But we'll communicate with you every step of the way. Our Rules & Expectations, Disclaimer, Newbie Guide and Application Form. Hey, awesome to hear that you're back. 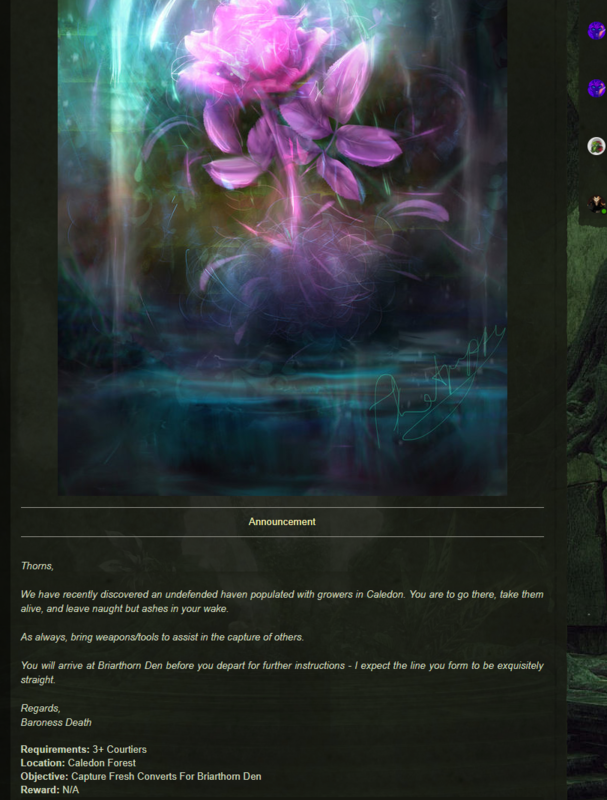 No I'm kidding, the thorns are an awesome group of people and it is super awesome they are back in the roleplay world. Thank you very all for the kind words! We're certainly glad to be around again, and have been having a lot of fun with plots and some cross Court RP with our friends in Envy. We're possibly looking for some persons in the future that could be heroic characters so to speak! Those who can win and lose gracefully, and wouldn't mind butting heads with Courtiers in plots. If this is something that could interest you in the coming month, please drop one of the above contacts a whisper ingame! I can't make any firm promises at the moment, but we're definately exploring some delicious delicious options. My name is Rian Nightfall, and this is my favorite Nightmare Court RP guild on the Tarnished Coast server. Thank you once again! We're steadily getting closer and closer to our member cap with a sweet and awesome memberbase! We'll be kicking off our second storyline coming this Sunday.